Client Letters | Nicholas Hoffman & Co. In the early 1980’s 30-year U.S. Treasuries were yielding more than 15%, inflation was running north of 13%, and the economy was sputtering at best with back-to-back recessions in 1980 and ’81. Sentiment was dour. Stocks were cheap, trading at less than 10 times normalized earnings or 40% below their long-term average multiple. Newly appointed Fed Chairman Paul Volker nearly doubled the federal funds rate from 11.2% in 1979 to 20% by the middle of 1981. He is widely credited for subduing inflation and laying the groundwork for what would later become known as the great moderation. It was impossible to know at the time, but looking back, the early 80s would turn out to be an important inflection point. For the next 35 years, long-term interest rates would grind inexorably lower, not in a straight line of course, but continuously marking a series of lower highs and lower lows. By 2016 the yield on 30-year treasuries hit an all-time low of 2.1% and the fed funds rate was barely above zero. This 35-year trend of falling interest rates has been a key component of this era of market history. It has been very supportive of risk assets. The path of long-term interest rates is something we and others have been watching very closely. For the last year and a half, 30-year treasury yields have been bouncing around in a sideways trading range just under 3%. That is until just recently. Earlier this month yields broke above 3.25% for the first time in four years. This looks like a significant development that could be signaling a major shift. It is impossible to know in real time, of course, but looking back, this may be an important inflection point. If the path of long-term interest rates is now up rather than down or sideways, it could have profound implications for risk assets going forward. In many ways today’s environment is the opposite of what we saw in the early 1980s. Interest rates, growth, and inflation have all been stubbornly low. Economic news has been mostly positive. Sentiment is upbeat. Credit is plentiful. By some measures, stocks have enjoyed the longest bull market expansion in history. 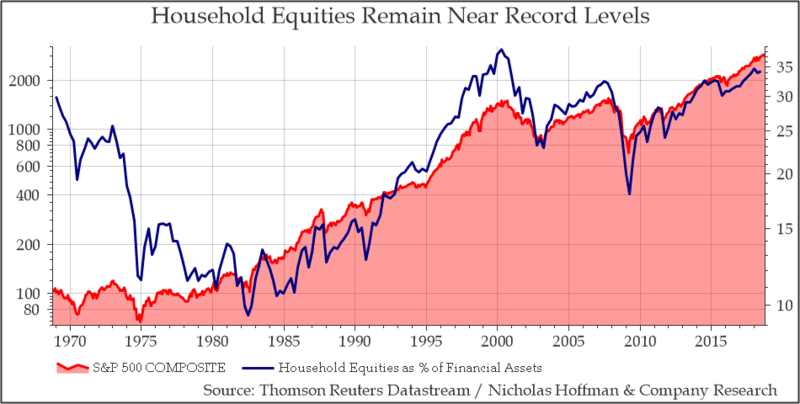 Households’ equity investments as a percent of total assets is now higher than it has ever been except during a short period leading up to the peak of the technology bubble in 2000. Many have argued this is all reasonable considering low inflation and low interest rates. But if the trend of inflation and interest rates has shifted, the argument may no longer hold sway. Concerns over inflation and interest rates are growing based on several factors. First, a tight labor market puts upward pressure on wages and downward pressure on corporate profit margins. The unemployment rate recently fell to 3.7%, the lowest rate since 1969. Job growth has now been positive for 96 straight months, further extending the longest continuous jobs expansion in history. Amazon recently announced it would raise its entry level wage to $15 an hour and lobby for a similar increase to the federal minimum wage, currently $7.25 an hour. The announcement follows Walmart’s earlier move to raise its entry level wage to $11 an hour. Average hourly earnings are growing at 2.8% and it would not be surprising to see wage growth accelerate from here, potentially raising inflation expectations and encouraging the Fed to quicken the pace of rate hikes. Trade tariffs are another area of concern. Tariffs are ultimately a tax increase on domestic consumers and tend to put upward pressure on prices and downward pressure on corporate profit margins. There remains a considerable amount of uncertainty around the future path of U.S. trade policy and its effect on future growth and inflation. One final area of concern involves the expanding federal budget deficit. Nearly 10 years into the economic expansion the U.S. is engaging in a level of deficit spending that is normally associated with counteracting a recession or high unemployment. The current deficit is approx. 3.7% of GDP vs. a long-term average of 2.9% going back to 1970. The Congressional Budget Office expects this number to grow to 4.9% in the next couple of years and potentially much higher if a recession arrives. More bonds must be issued to finance this additional deficit spending, increasing the supply of treasuries available in the market. At the same time, the Federal Reserve is contracting its balance sheet at a rate of $50 billion per month which reduces the demand for treasuries. It would not be surprising for this increased supply and reduced demand to put upward pressure on interest rates. There could be a self-reinforcing component to this phenomenon as increased rates lead to higher interest expense on the debt, which then leads to additional deficit spending to cover the higher interest expense, and so on. What does all this mean for investors? If this is indeed a durable shift in trend for inflation and interest rates, then the next ten-year period is not likely to resemble the last ten-year period in many key respects. The returns on risk assets are likely to be somewhat lower than their long-term averages. Volatility is likely to be somewhat higher than it has been recently. Bonds may not offer the same diversification benefit as they have in the recent past, especially long-term bonds. Active management may be more attractive relative to passive exposure than it has been in recent years. No matter how events unfold we will maintain our focus on long-term strategic thinking, careful cash flow planning, being vigilant about taxes, fees, and expenses, and identifying opportunities in the less efficient and less correlated private markets. These are the areas where we can add value no matter what the direction of interest rates turns out to be. This entry was posted in Client Letters on October 23, 2018 by nhoffmanandco.